The movie or TV show files that are been downloaded from Internet especially through BitTorrent (BT) or eDonkey2000 (eD2K) networks may come corrupted or unplayable. Other possible problems with video clips can be cannot played back in Windows Media Player with error message, video playback stops or freezes suddenly, distorted or disoriented pictures or images, broken or not smooth video stream, prematurely terminated or partially downloaded files, video cannot be seeked and etc. The error in playing a video files, especially after spending hours to download the media, is frustrating and annoying. Re-downloading the files can take ages again, and worse if the videos are no longer available elsewhere. There are several software utilities available that can attempt and try to fix, repair and recover broken or corrupted AVI video files. Here’s a listing of free AVI repair utilities. Although a lot of names of the software programs has something like “DivX”, the repairing and fixing of video files should work on most video files in .avi file extension. In addition, most programs will automatically create another copy of “fixed” video without modifying or changing original files. However, it’s recommended to backup your own copy of videos prior to start fixing to avoid accidental damage. 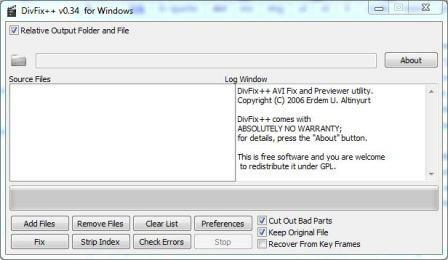 DivFix++ (or DivFixPP) enhances and improves on the DivFix, the pioneering AVI video repair utility, to fix the bugs and fasten the performance. DivFix++ started its life as CLI “DivFix” clone, and has since been given a GUI. Thus, DivFix++ also supports several CLI (command line interface) argument parameters. DivFix++ repairs broken AVI file streams by rebuilding index part of file. By doing so, user can also preview movies which has no index part, such as files that are currently been downloading from ed2k (eMule) or Bit Torrent networks. DivFix++ specialy designed for preview video download files from P2P networks. 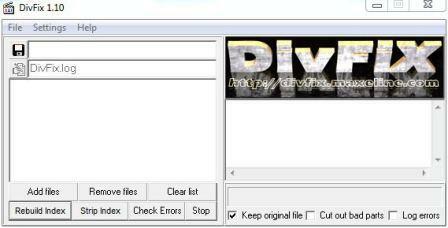 Essentially, DivFix++ is a AVI video fix and preview program. It’s standalone program which does not require installation, and cross-platform. There are even versions for both 32-bit (x86) and 64-bit (x64) operating system, and 1-click install package for Linux. To repair and fix a AVI file with DivFix++, just drag and drop the files to DivFix++ window at “Source File” text box, or click “Add Files” button to select the files. Then, just click on “Fix” to repair the AVI files. Tip: “Strip Index” button removes index of AVI video files, causing the video unsearchable or unseekable (fast forward or backward), while “Check Errors” allows user to check if the files has any error prior to fixing. DivFix was created to be able to watch partially downloaded DivX (AVI) movies, by rebuilding or stripping the index part of the movie, which is at the end of the file. There are also a basic error detection, which can detect serious errors in the audio/video stream. DivFix was developed since 2000, but was no longer in active development since 2003. Nonetheless, it should continue to work to repair most broken AVI files. DivFix is available as free download, and no installation required. It’s a standalone program so just download and run it. DivXRepair can repair corrupted AVI files and eliminate freezes. DivXRepair is based on VirtualDub, and it automatically detects and cut off or eliminates bad frames which are undecodable or freezing, then re-assemble the AVI file. Digital Video Repair (DVR) is a free small utility for repairing (fixing) AVI files. Features of Digital Video Repair include ability to detect the bad data, repair the index AVI file, detect the key-frame for XviD, DivX 4/5, 3ivx, Microsoft MPEG4 (versions 1, 2, 3), DivX 3.11 and late (versions 1, 2, 3 Low or Fast), Angel Potion (versions 1 or 2) codecs, and support the Standart AVI file format (Microsoft Video for Windows) and the OpenDML AVI file format. Digital Video Repair also able to process multi-track AVI files, repair AVI files with size of over 2Gb, failed in recording, or without MOVI-chunk, delete not important information (chunk JUNK), and has multilingual support for English, German and Russian via System Menu.